This document presents how donors, both individually and collectively, have made numerous commitments to advance gender equality through their official development assistance (ODA). For instance, the European Commission (EC) has acknowledged that gender equality is a fundamental human right and instrumental to achieving the MDGs. 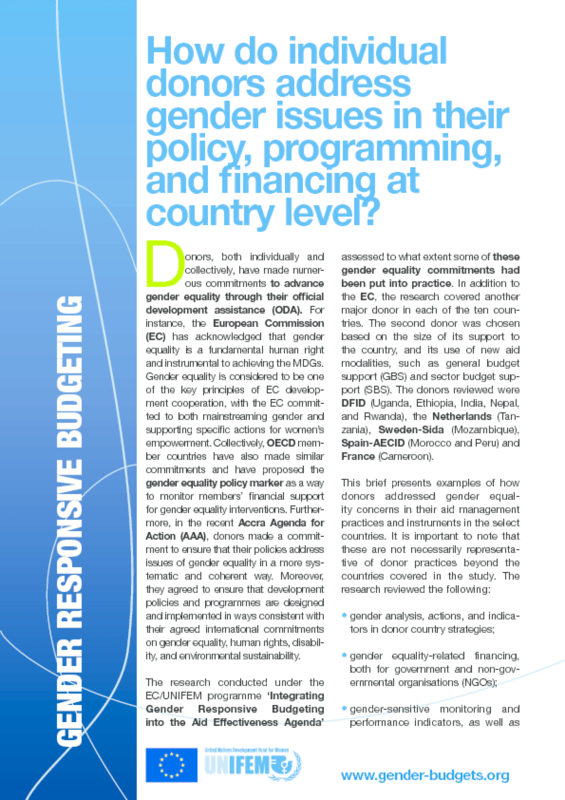 The research conducted under the EC/UNIFEM programme ?Integrating Gender Responsive Budgeting into the Aid Effectiveness Agenda' assessed to what extent some of these gender equality commitments had been put into practice. In addition to the EC, the research covered another major donor in each of the ten countries. This brief presents examples of how donors addressed gender equality concerns in their aid management practices and instruments in the select countries. It is important to note that these are not necessarily representative of donor practices beyond the countries covered in the study. Copyright 2009 United Nations Development Fund for Women. Title: How Do Individual Donors Address Gender Issues In Their Policy, Programming, and Financing?